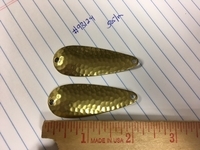 These Worth 2-1/4 inch casting spoons are great for making your own lures. The polished hammered brass gives off great light. Priced at wholesale for quick sale.